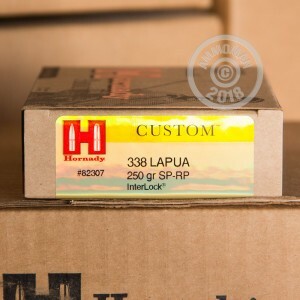 Grab a few boxes of this .338 Lapua hunting ammunition for your next journey out into the field. 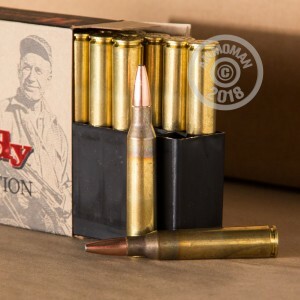 These cartridges fire an InterLock Soft Point bullet that delivers great ballistics and deadly results! Each round fires a 250 grain InterLock soft point bullet at 2,900 feet per second. 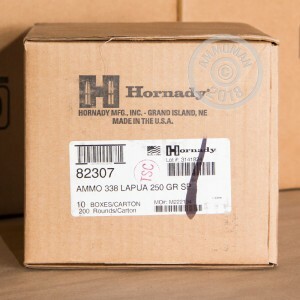 This ammo is manufactured by Hornady in Grand Island, Nebraska and packaged in 20 round cases. Each cartridge uses non-corrosive Boxer primers and brass cases. Into some serious long-range shooting? AmmoMan.com has you covered. Grab more than $99 of ammo from our site to qualify for free shipping!